Administrative assistant of mission and ministry Mrs. Mallory Sigmon and assistant Dean of Mission and Ministry Mr. Jeff Gramme plan the next LIGHT group lesson for December. Students seeking ways to help the community, give back to others, and continue to live a strong and devoted Catholic life can find their place with the Cathedral Catholic High School’s Living in God’s House Together program. The LIGHT gives CCHS students an opportunity to give back to the community through corporal works of mercy. The on-campus program is run by Mrs. Wells and the assistant Dean of Mission and Ministry Mr. Nicholas Hurt. Every CCHS student participates in a bi-monthly LIGHT group lesson taught by his or her red one teacher. This year, unlike years past, features a theme of helping the homeless. Through the LIGHT program, CCHS students will be mentored and taught by fellow peers. In previous years, students would donate tissues, baby diapers, canned foods, backpacks, and other items that many poor families needed, but could not afford. However, this year’s requested items will differ those of past years. LIGHT group meetings hope to expose students to less fortunate communities and encourage a culture of giving back. Any charitable action, big or small, helps support another community in need. These small actions come major positive changes, according to Mrs. Wells. “At CCHS our main goal is to build community within each LIGHT group,” Mrs. Wells said. “We also want to create awareness on homelessness and how we can help those less fortunate. Cathedral Catholic High School emphasizes often the importance of combatting homelessness, especially in this year’s Living in God’s House Together program. However, students leading the charitable works is now on display by the new student leadership team. Alivia Lomax ‘21, a participant on the team, attended her first team meeting recently, and she immediately felt motivated to help. CCHS mission and ministry teachers recently created a new student leadership group to help raise awareness of the dangers of homelessness. The group has confirmed it will help with the Advent socks and blanket drive in December along with the Ash Wednesday event Homeless For A Night, where students spend the night at school to experience first-hand the effects on homelessness. The students involved in the program also will learn beneficial practical leadership skills through the development and implementation of the school homelessness interaction program, according to Mrs. Wells. Along with brainstorms and discussions, students in the leadership team confronted what they can do to help and how to get everyone more involved in assisting the homeless around San Diego. To correspond with the theme of homelessness focused on in this year’s LIGHT group, Mission and Ministry brought forth this student group to increase the involvement of the CCHS community. 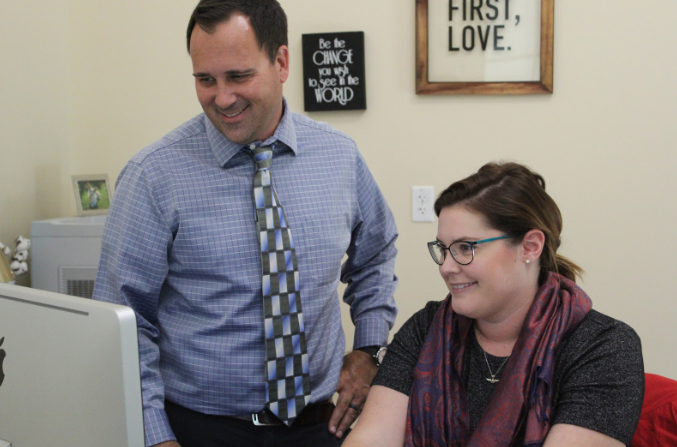 “The Mission and Ministry team feels that the best way to engage with any social justice topic is through student involvement,” Mrs. Wells said. “We’ve found some of the most effective programs are those developed by students for students. It is an opportunity to be tangibly engaged in helping others.